Malt whisky production begins when the barley is “malted” — by steeping the barley in water, and then allowing it to get to the point of germination. Malting releases enzymes that break down starches in the grain and help convert them into sugars. When the desired state of germination is reached, the barley is dried using the traditional kiln floor. BenRiach’s Stewart Buchanan explained: “For the last year we’ve been working hard to get the maltings back up and running. After being shut for the best part of thirteen years, the machinery is still in great condition. “Earlier, we got some weight on the system to see how it would run under stress. Three tones of barley whirled round the floors and it was great to hear its blood pumping and the old place coming back to life. Founded in 1898, BenRiach is a single malt Scotch whisky distillery in the Speyside area of Scotland. Gaelic for “speckled mountain”, it’s operated independently by the BenRiach Distillery Company Limited which was formed by two South African funding partners, Geoff Bell and Wayne Keiswetter, and Scotch whisky expert Billy Walker. In 2008, the company expanded its portfolio with the acquisition of the GlenDronach distillery in Aberdeenshire. 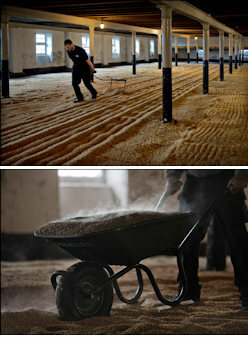 Two pictures show the resumed maltings at BenRiach.